Recent protests surrounding the New Mining Law by the cooperative sector in Bolivia climaxed to dangerous levels this past week. The approval of the law was stalled when legislators modified the project in the Legislative Assembly. They claimed that an article allowing cooperatives to sign third-party contracts with private or foreign capital was unconstitutional and removed it. The cooperative sector responded with national blockades resulting in the deaths of two cooperative day-labourers as well as approximately 50 others injured. Now, with the national debate that has surfaced, it was publically revealed that in practice, this had already been occurring and that there were over 40 cooperative-company joint contracts in existence. The boiling point was reached when president Evo Morales appeared publically yesterday claiming that the contracts were “anti-national” and that those involved in the signing of these contracts should be “tried for treason.” A national inquiry has been called by the Mining Ministry to examine each contract. This is particularly important for silver producing giant Coeur Mines’ 100 per cent owned subsidiary Empresa Minera Manquiri (EMM) who operates in the Cerro Rico de Potosi (San Bartolome operation) in Bolivia. According to EMM’s Environmental Assessment Report in 2004 and recent company reports, Manquiri has 7 contracts signed with the cooperative sector, resulting in a questioning of its legitimacy as a company in Bolivia. Coeur Mining’s reaction to all of this has been silent. As a publically listed company on the TSX and NYSE, the company has minimal requirements to fulfill (less in Canada) as an obligation to its shareholders. That being said, no shareholder notices have been filed to date. As we will see later, there are other potentially more dangerous risks that they are taking which make this case a ticking time bomb. How did Coeur Mining end up in Bolivia? Coeur Mining, when they invested into the San Bartolome operation through their subsidiary Empresa Minera Manquiri (EMM) was well aware of the risks that this operation held for their investment. Previous World Bank study completed by Melvin Bernstein during the neoliberal government’s privatization attempts claimed that the single most significant obstacle interfering with privatization would be the incoherency of cooperative and state owned mining concessions throughout the mountain. In the 1990s, Asarco Inc. acquired the rights and began explorations in three areas (Santa Rita, Diablo, and Huacajchi) in the Cerro Rico. In 1996, Asarco Inc. was purchased by Coeur D’Alene, thus transferring the rights to those three areas to Coeur. The other half of their operation, includes the ex-COMCO Processing Plant which was purchased from COMSUR when Gonzalo Sanchez de Lozada fled the country in 2003. Other work areas are included in Third-Party Lease Contracts that the company has with seven Mining Cooperatives. 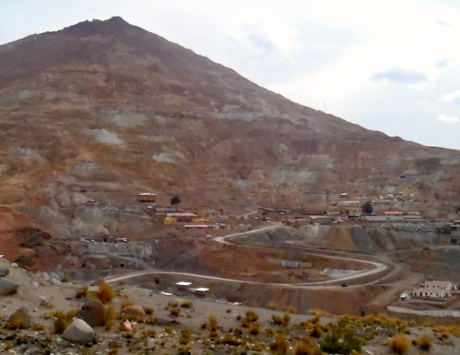 Presently Coeur through its subsidiary EMM is situated among the top transnational producers of Silver in Bolivia accounting for 22.27 per cent of the national production for 2012, coming in second behind Japanese Giant Sumitomo. What Does Coeur’s San Bartolome Operation Look Like in Bolivia? First it is imperative that we understand what the Cerro Rico is and what it looks like in order to understand what EMM’s impact and role is in Bolivia. The Cerro Rico (Rich Mountain) was one of the most important Spanish colonial mines during the conquest. Its silver production fueled the origins of the rise of European capitalism. The Cerro Rico, historically conic in shape, has now begun to deteriorate from the extensive, and lately largely unorganized exploitation. 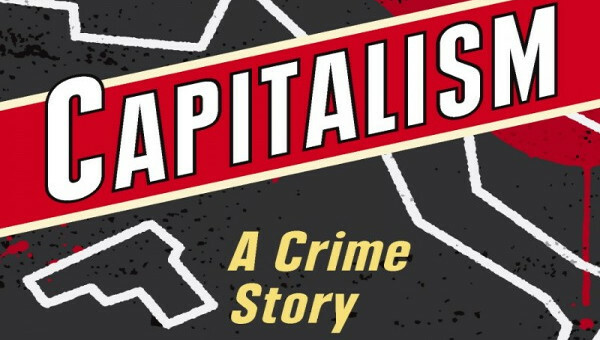 During its re-privatization after the neoliberal Supreme Decree 21060, it was deemed “not profitable” by the government and thus the majority of its Comibol rights were signed over to the cooperative sector through Lease Agreements. Despite its five-century old extraction, Cerro Rico still houses riches within and on top of its towering flanks. Its economic pre-assessment indicate a potential 400 million tons of mineral to be extracted at “relatively low cost” to the company who would be willing to invest despite the political ownership mess of the mountain. As a result of this richness and the boom in international prices nowadays approximately 40 cooperatives operate in the Cerro Rico alongside Coeur, with a labour force that is estimated at an upwards of 22,000 miners in 2008. Coeur maintains their labour force to a mere 350, but identifies that the key to “maintaining stability” in a conflict prone area such as the Cerro Rico has been through forging partnerships and providing employment opportunities (contracted) to cooperative miners. The political mess that Bernstein referred to in 1987 has worsened over the years with the increase in the number and size of cooperatives. Cooperatives work independently between each other and often work groups or cuadrillas work independently as well which means that one work group in the interior mine could be dynamiting, whilst another, unaware, works in the blast zone. The mines themselves look like rat holes weaving in and out of a cheese-like mountain and the actual working conditions are appalling which makes Coeur Mining’s presence there all the more questionable. Musol, a women’s organization from Potosi calculated that 14 cooperative miner wives from the Cerro Rico are widowed each month. The minimal news coverage of mining deaths that makes it into the regional paper El Potosi often highlights how young near teenage miners fall to their death. Other studies reveal the politics and difficulties to obtaining a national statistic, which could accurately capture the number of bodies that are swallowed by Bolivian mines each year. EMM extracts its silver dore in a non-traditional way. Given its lengthy history of rapid exploitation, the Cerro Rico has acidic dumps referred to as pallacos and sucos. Since these dumps are flanking both sides of the peak of the mountain in small, loose hills, the rock is collected, loaded into trucks, and then transported to the grinder and mills. According to the company, this moving of materials does not further damage the already crumbling mountain, and they see their work as a “clean-up” and thus environmental-favour to Potosi. EMM entered into production at San Bartolome in 2008 with a production of 2.9 million ounces of silver. In 2009 (just 1 year after entering into production) earned a $6.3-million net-profit on its operations in Bolivia. Despite the recent “decline” in silver prices, after just five years of production (2008-2012), Coeur identifies a $201-million net profit from San Bartolome. These sky-high profits come from the obviously low extraction and processing costs at San Bartolome. Economic Assessments completed by Asarco in 1999 claimed excellent profitability and low-extraction costs since only recollection was necessary, highlighting the areas where mineral concentration was higher. And so what makes San Bartolome production cheap? First, the make-up of the deposits, which we have previously discussed, are on-surface deposits, meaning no interior mine work is necessary, little investment was needed for infrastructure, and fixed capital costs such as heavy equipment were also low. Second, it is unclear exactly what the negotiation was between Compañía Minera Don Mario (subsidiary of COMSUR) and Coeur D’Alene Mines in order to determine the degree to which Coeur D’Alene received a deal for the plant and contracts. Bolivian Investigator Andres Soliz Rada has identified numerous irregularities that occurred both with the acquisition of mining rights and with the illegal extraction and treatment of mineral by Gonzalo Sanchez de Lozada’s companies in Cerro Rico. This fact went unchallenged when Coeur acquired the Rights and negotiated with Comibol later on in their early history. 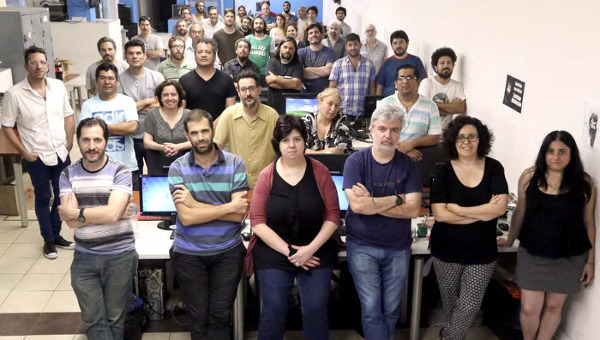 Finally, despite the fact that Bolivia does house the only unionized workers under the Coeur mother company, the number of unionized workers are few, with staff, technicians and workers totaling a meager 344 employees. The company is successfully tercerizing their labour obligations to the precarious cooperative sector workers who work side-by-side Manquiri salaried workers (loading and unloading mineral) but on a contract-basis. 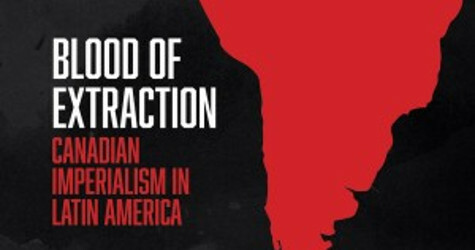 On a superficial level one can only imagine the tension and conflict that are visibilized when the ruptures of experience between salaried unionized workers and contracted peons are revealed as the 22,000 cooperative miners struggle to extract every last drop of mineral from the mountain. The reality of that mountain is the real “mess” that investigators and technicians alike have identified, years of concessions atop concessions, atop concessions. Cooperatives and private enterprise all working alongside and on top of each other, maximizing the tensions and dangers of daily labour. According to the EMM’s Environmental Assessment Report that was completed in 2004, of the seven cooperatives that have contracts with the company, there is a combined labour force of 3,523 cooperative partners and 3,381 salaried peons which amounts to a total of nearly 7,000 cooperative miners. It is important to note that those cooperative miners would not be entitled to the Collective Bargaining Rights, Industrial Labour Protections, Insurance or Health and Pension coverage as their salaried unionized brothers are. Instead they receive a day wage for their dangerous work. The extremely high concentration of miners in the mountain, along with high mineral prices and low-employment opportunities in other sectors suggests that Coeur through EMM benefits from the risk and economic precarity of having a union surrounded by a precarious cooperatives and their peons. The effect is two-fold, Coeur is able to keep their salaried workers wages and conditions minimal because of the extensive extra-labourforce and cooperatives work however they are asked and at whatever pay level because there are no alternatives. Production has been falling over the past years in San Bartolome. According to their annual reports, the decline in production is due to both decreasing mineral grades, and the barriers that the Bolivian government has set up which have stalled production. In 2013, despite the fact that the company milled more ore than previous years of operation, their total silver produced was only slightly higher due to dropping grades. semi-transparent with their shareholders as to some of the reasons for this decline in grade. Due to the rapid deterioration of the Cerro Rico and the worsening working conditions, the Civic Committee of Potosi pressured the government into action. On October 8th, 2004 Carlos Mesa approved Supreme Decree 22787 which specifically regulated mining activities in the Cerro Rico and included a paralyzation of all sub-terrain work above 4.400m. EMM’s work was not suspended by this decree because its work is on the surface. That changed, however, when the Comibol Board of Directors resolved (Resolution #4218/2009) to modify this decree suspending all work above the quota. For a brief period of time Manquiri removed its equipment (as ordered by Comibol) from the areas above 4.400m, and work was suspended. However, surfacing Wikileaks documents reveal that EMM, in particular its president Humberto Rada, was busy dialoging with both government officials and cooperatives to get the restrictions lifted. The American embassy even assured EMM that it was prepared to “intervene” if necessary to see that the suspension did not affect the San Bartolome operations. This political pressuring worked and the suspension proved only temporary, as EMM was quick to lobby its cooperative partners to try and make headway. Starting in 2010, the government began giving in to cooperative partners of EMM and to date three of their cooperative partners successfully lobbied the government to receive an exploitation allowance. These agreements enable EMM (through their third-party lease contracts with cooperatives) to resume their business as usual in three designated areas above the 4.400m quota. EMM claims that their extraction does not damage the structural integrity of the mountain and that this will soon be confirmed by government reports. Their hope is that restrictions will be lifted so they can expand into full production capacity once more, moving back into their work areas. Geological and Technical Mining Service of Bolivia) there are various “High Risk” zones prone to collapse and cave-ins (see photo below), which provide great risk to miners and operators. The minimal news coverage of mining deaths that does make it into the regional paper, El Potosi, often highlights how young near teenage miners fall to their death.But what does the quota mean in terms of economic feasibility? According to the economic feasibility study completed by Asarco in the 90s, the richest mineral concentrations in the pallacos and sucus are encountered above the 4.400m quota. 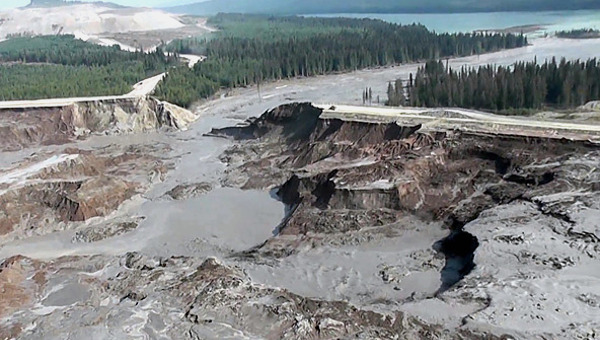 And according to Bernstein, the collection of these tailings in general is much more economical when accessed from above the dumps rather than below them. According to the Technical Report San Bartolome completed by Coeur in 2013, the Huacajchi Deposit is the richest to be followed by Diablo and then Santa Rita. The suspension of work areas clearly has had some impact on the economic feasibility of the project, and despite “mild warnings” from Coeur in their most recent Annual Reports (see Annual Reports Coeur D’Alene 2010-2013), they lightly warn “possible re-evaluation of reserves” in the event that work becomes suspended again. On March 14, 2013, Gilberto Mirabal, the Chief Operator of the Potosi Regional Office of Comibol announced that there were 12 cooperatives working above the paralyzed 4.400m limit. Despite the fact that Coeur was being semi-transparent to its shareholders, the Bolivian general public was unaware that it had signed contracts with cooperatives that were continuing to work above the quota. Once Mirabal announced that 13 cooperatives were still working above the quota, the people of Potosi were furious. And when the list of the 13 cooperatives still continuing to work above the quota was revealed, four of those cooperatives also appeared on EMM’s list of partner cooperatives. EMM had succeeded in mobilizing (or at least not discouraging) four of their partner cooperatives to continue to work. Manquiri Risk Zones and Work Zones. In the Technical Report for San Bartolome published in 2013, it is revealed that another cooperative Cooperativa Reserva Fiscal was granted permission from the government (after lengthy negotiations) to work above the quota in the Huacajchi and Huacajchi Sur zones, areas particularily high in mineral concentration. 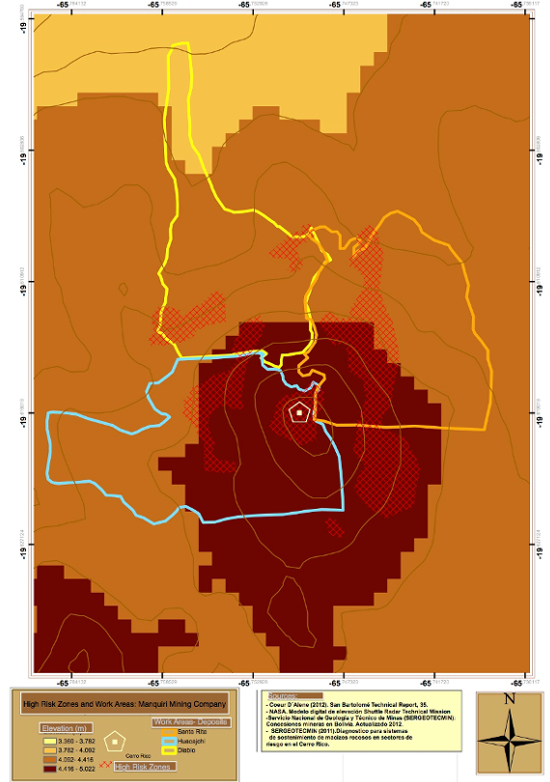 The map (below) shows the overlap of the “high-risk” zones as they were determined by SERGEOTECMIN with the areas highlighted by Coeur in the San Bartolome technical reports as being work areas. The red-hashed grid areas are the “high-risk zones.” It is clear that a large portion of the area above 4.400m is “high-risk” with a large portion of that area being indirectly worked by EMM. Despite both Coeur and the cooperative partners being aware of the potential risks and dangers of operating above the quota in these zones, operations continued. It can be speculated that, as many Bolivian scholars have argued, since prices have increased significantly, many cooperative partners are able to contract out their labour to peons, especially in the case of the Cerro Rico. Based on the previous Musol statistic, we can estimate, 168 peon miners die every year in the mountain. If we multiply that number by six, the number of years San Bartolome has been operating, we get a very modest estimate of 1008 deaths, over three times their present official workforce in Bolivia. The fact that Coeur is not only selective but also silent on this issue suggests that they, desperate to make profit margin milestones, knowingly put their own workers, as well as those without social security, benefits and pensions, at risk. “Otherwise, Manquiri has a relatively normal relationship with the cooperatives. There are daily complaints and minor issues to be dealt with considering they are working on overlapping territory, but Manquiri works hard to keep things cordial. “Manquiri has hired the cooperatives to conduct hauling services. The cooperatives run the trucks that bring the rock/dirt down the mountain to the Manquiri processing plant. In addition, in all of the space below 4400m, Manquiri has a joint venture with the state mining company COMIBOL and with the cooperatives. Manquiri has the rights for surface mining, while the cooperatives get a percentage of their royalties (4 per cent is split between COMIBOL and the cooperatives) and have the rights for internal mining on the same land. And so we have come full circle. The political implications for the economic “feasibility” of the Coeur Mining operation in San Bartolome are many. With the growing national concern about the cooperative sector in general at its all time high, the government is finding itself caught between protecting State interests, appeasing the cooperative sector and protecting private capital. Since popular knowledge of these third-party contracts was minimal before the treatment of the law in the legislature this point has been the one that has enabled a turn away from the cooperative sector as the main focus of national debate and has enabled the “silent observers,” transnational companies, to be dragged back into popular discussion. One has to question what Coeur has to gain from the New Mining Law and what they have to lose. If growing discontent continues against the cooperative sector, and Morales fulfills the statement he made this week, then Coeur can rest assured that those contracts will be revised and that, regardless if the government opts to change or modify them, the Bolivian people will unlikely stand by and allow transnational companies to continue profiting from the extraction of raw materials, at the expense of many of the country’s youth. The decision to continue to approve the law against the will of the cooperative sector will not only be a loss for the cooperatives themselves, but Coeur Mining as well. Public response to the idea that transnationals can sign contracts with cooperatives has been less than positive, and the “powerful political allies” that Coeur touts as risk-mitigation may actually prove to be less powerful and less organized than they suspect. Manquiri will cut their losses and leave if things get too ‘risky’ but I suspect things are already risky enough for a lot of shareholders, and definitely for the Bolivian miners that engage in “risk” each day they set foot into a mine in the Cerro Rico. Is Manquiri prepared to reveal the terms and conditions of these contracts they signed with cooperatives? Will the Civic Committee of Potosi permit their future operation when these terms are revealed? How much longer will cooperatives work alongside the salaried plant workers of EMM? How much longer will the peons continue to allow their over-weight partner bosses earn off their labour? This paper is part of a larger investigation to be presented at CALACS Annual Congress 2014. Whitney & Whitney. 1989. “Preliminary Economic Evaluation of the silver-tin production of Cerro Rico, Potosí.” Solicited by the UN Department of Technical Development. Data extracted from personal compiling of Ministry of Mining Data production/company 2012. Whitney & Whitney. 1989. “Preliminary Economic Evaluation of the silver-tin production of Cerro Rico, Potosí.“ Solicited by the UN Department of Technical Development. Francescone, Kirsten and Vladimir Diaz. 2012. “Las Cooperativas Mineras: Entre socios, patrones y peones.” Petropress, 30. Bernstein as cited in Whitney & Whitney, 1989. See: “Mineria deja 14 viudas cada mes en Cerro Rico de Potosi,” El Potosi . Pallacos and Sucus are the dumps of product from previous colonial and early 20th century exploitation that are rich with mineral. Data extracted from personal compilation of financial information from Coeur Mining Annual Reports 2007-2013. The report was solicited by the Asarco Inc. Company to determine feasibility. See: Bartos, Paul (2000). The pallacos of Cerro Rico de Potosí: A New Deposit Type. Economic Geology , 95. See Technical Report, San Bartolome, 2006. Coeur D’Alene Mines. 2013 Annual Report, Coeur Mines. Coeur D´Alene. 2013. CSR Presentation. This number is surely now greater due to the significant increase the country has seen in mining cooperatives with the increase of mineral prices over the past few years. 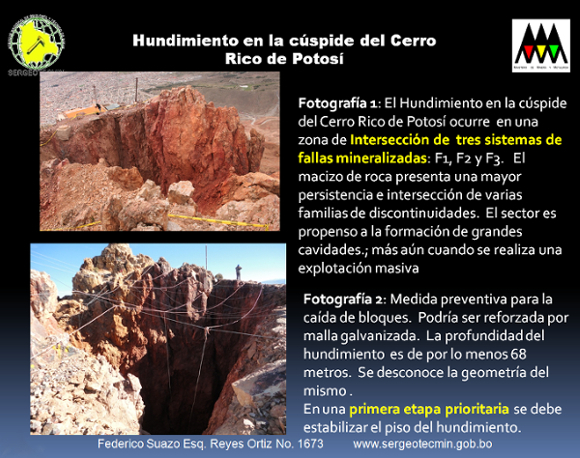 See: Suspension of Mining Activity on Cerro Rico, Wikileaks Cable #09LAPAZ1477_a. Accessed online: wikileaks.org/cable/2009/10/09LAPAZ1477.html. See: SERGEOTECMIN 2011. Diagnostico para sistemas de sostenimiento macizos rocosos en sectores de riesgo geológico en el Cerro Rico de Potosí. See Technical Report: San Bartolome. 2013. Coeur Mines, pages: 30-31. This obviously does not include the young adolescents and adults that may not be married and who are the majority of peons working the mountain. Wikileaks. Bolivia Mining: Update on Cerro Rico. Accessed online: wikileaks.org/cable/2009/12/09LAPAZ1593.html.